More than two million residents have been evacuated as Hurricane Florence roars toward the Southeastern United States with sustained winds of more than 175 km/h. The U.S. National Hurricane Center says the Category 2 storm is taking aim at North and South Carolina on Thursday. A life threatening storm surge is expected along the Atlantic coast with an incredible 800 mm (30 inches) rain possible. Emergency officials call Florence “a monster” and cities like Myrtle Beach have become eerily empty as the hurricane approaches. Tropical Storm Gordon has claimed at least one life after striking the American Gulf Coast late Tuesday near the Alabama-Mississippi border. Authorities say strong winds caused a tree to fall on a mobile home in Pensacola, Florida where a child was found deceased. The U.S. National Hurricane Centre says Gordon weakened as it moved inland and was not powerful enough to reach hurricane status. Tornado warnings were issued after radar showed possible twisters stemming from the storm. Forecasters say as much as 200 cm of rain (almost 80 inches) could fall and the system could have an impact on Eastern Canada by early next week. Tropical Storm Philippe, the 16th named storm and 18th tropical system of the 2017 Atlantic hurricane season, is no more according to the U.S. National Hurricane Center. The storm brought heavy rain to central Cuba and the Bahamas in addition to spawning several tornadoes when it crossed south Florida. Sustained winds reached 95 km/h with higher gusts reported before Philippe weakened over the western Atlantic. However, Environment Canada says the remnants are combining with a low pressure system which will bring strong winds and heavy rain to New Brunswick on Monday. Ophelia pounds Ireland & U.K.
Schools and businesses closed in Ireland when the remnants of Hurricane Ophelia brought destructive winds up to 160 km/h which downed trees and power lines creating widespread power outages. Flights, ferries and even buses were cancelled and at least three deaths are attributed to the storm which officials say is the worst to hit Ireland in 50 years. Strong winds also caused disruptions in Scotland and northern England where rail services were halted after fallen trees blocked lines. Ophelia formed in the eastern Atlantic on 11 October and became a Category 3 hurricane three days later. The U.S. National Hurricane Center says Ophelia was the furthest east ever recorded for an Atlantic hurricane. Hurricane Irma is being called a “potentially catastrophic” category 5 storm by the U.S National Hurricane Center with maximum sustained winds of 295 km/h as it bears down on the eastern Caribbean. The core of Irma is expected to move across the northern Leeward Islands overnight and will track close to the Virgin Islands and Puerto Rico by late Wednesday and the Dominican Republic by Thursday. A hurricane watch has also been issued for eastern Cuba along with northern Haiti, southeastern Bahamas and the Turks and Caicos. Forecasters say Irma is increasingly likely to target Florida (now under a state of emergency) and parts of the American Southeast as a dangerous hurricane this weekend. Hundreds of thousands of Florida residents along its east coast from Fort Lauderdale to Cape Canaveral have been told to evacuate in advance of Hurricane Matthew. The powerful category 3 storm is churning through the Bahamas after a brush with eastern Cuba and has maximum sustained winds at 185 km/h. Floods and mudslides from the storm in Haiti and the Dominican Republic have claimed more than 800 lives. The U.S National Hurricane Center believes by early Friday, Matthew will track parallel to the Atlantic coast from Florida to the Carolinas and is not certain yet if the storm will hit land. The last time a major hurricane made landfall in the United States was Wilma in 2005 which was blamed for 35 deaths and billions of dollars in damage. The Canadian Hurricane Centre doesn’t believe Matthew will have any significant impact on Atlantic Canada. Tropical Storm Erika has claimed almost 20 lives in the Caribbean after almost 400 mm of rain fell over some islands including Dominica with fast-moving floodwaters sweeping cars and homes away. High winds and heavy rains have also pounded Puerto Rico and the Dominican Republic today. The U.S. National Hurricane Center says Erika will likely impact Florida by Monday which has prompted the state governor to declare a state of emergency. 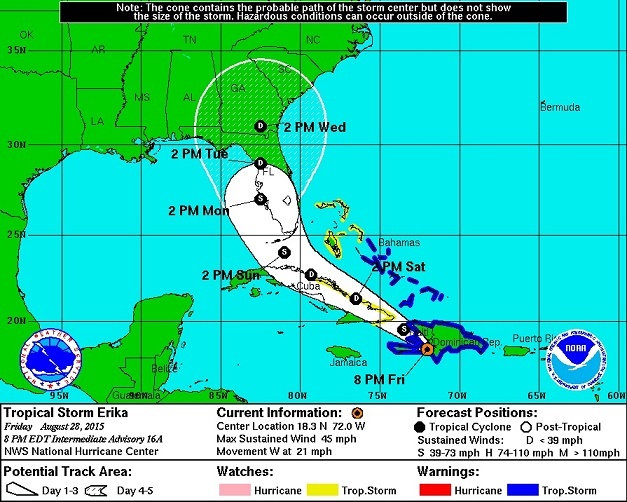 Forecasters say Erika will likely be downgraded by the time it reaches the U.S. mainland.